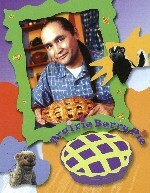 Prairie Berry Pie is a warm, entertaining and educational half-hour series for pre-school children, involving both human and animal puppet characters. Born out of the same tradition as Shari Lewis’s Lamb Chop’s Play-Along and Sharon, Lois, and Bram’s Elephant Show, Prairie Berry Pie creates a safe and comfortable world of trust and respect — as well as friendship and fun. Each episode includes a strong dramatic story and lively, singable songs, while teaching pre-school social skills, illustrating themes of Canadian life, and recognizing the country’s rich cultural diversity. Host Kennetch Charlette (Big Bear) plays David, a First Nations storyteller and singer, who acts as caregiver to a pair of puppet “kids” – Sasha the skunk (Janni Lauzon), and Clementine the porcupine (Trish Leeper). Rounding out the cast is Melissa Hande as David’s friend Mackenzie and Tom Rooney (Gilda Radner – It’s Always Something) and Kent Allen (Murder Seen) as a pair of zany brothers, Gridley and Franklin, who bring a splash of comic energy to end each show. Created by Geoffrey Ursell and Barbara Sapergia, Prairie Berry Pie gives life to such core values as kindness, fairness, honesty, and trust. Everything you need to make — and keep — a friend. Through comedy and drama, through play and absorbing activities, kids learn pre-school social skills, as well as get practical information about the way the world works. What do different words mean? What are colours? What’s a Jingle Dance? What’s big and what’s small? What’s loud and what’s quiet? And all of this is done in an engaging, humorous, and heart-warming way. Prairie Berry Pie is produced by Minds Eye Entertainment and Moose Jaw Light & Power.